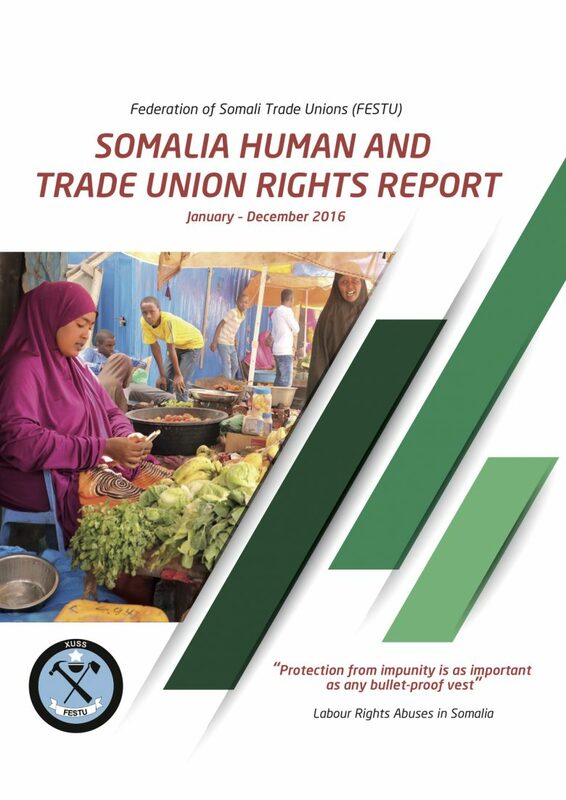 The Federation of Somali Trade Unions (FESTU), an umbrella organization of free and independent trade unions, which is an affiliate of the International Trade Union Confederation (ITUC), had judiciously considered the World Bank’s Somalia Economic Update. The World Bank’s July update examines sustainable resource mobilization and a strengthened state that can provide not only security, but also social protection and services. As part of this, the report encourages improvements in public finance management and education. The Bank notes with concern that education and health were only allocated $6.2 million USD and $1.5 million, respectively, in the 2016 budget and accounted for only 2% of that budget. The report shows that only 39% of these budgeted amounts were actually disbursed and calls social protection “underfunded”. “The support for public investment is welcome stance. Robust public investment is needed to promote inclusive, sustainable development, and private sector solutions alone are inadequate for the task. The technical and practical recommendations from the Bank on how to improve tax and revenue collection are productive,” said Omar Faruk Osman, FESTU General Secretary. The Bank urges the Federal Government of Somalia to engage in extensive dialogue with the private sector to agree on “ways to increase domestic revenue in a way that doesn’t disincentivize the private sector—a sector that has been an engine of Somalia’s development in the past two and half decades”. FESTU believes that the focus on bipartite dialogue between government and private sector bypasses tripartite dialogue of government, business and labour. Tripartism is needed to fully realize the goals enumerated in this report, especially on progress toward formalization where labour can be a key voice and driver of change. In the context of a weak Somali state, a heavy reliance on the opinion of the business community alone could lead to too much deference to the private sector and foreign business and subsequent erosion of the potential tax base. This risk of too much deference to business is also important on the issue of formalization. The Bank recommends efforts to formalize large companies in the informal sector, especially the high-volume telecommunications and money transfer sectors, but goes on to note that “companies are resistant to change”. “The report acknowledges that informality is a major barrier to sustainable resource mobilization. Given the importance of informality in limiting the tax base of Somalia, the World Bank should focus more on supporting transitions from the informal to formal economy. This would have the added bonus of mobilizing revenue and creating decent work” added Osman. The Bank’s recommendations in the report about the civil service raise some concern of the labour movement. The World Bank criticizes the rapid growth of public sector employment in the “administrative and sectors” and suggests that the share of revenue spent on public sector wages is too high. The report notes that increases to staff in security and social services was small. “This last point is a good one; the federal government should focus on hiring civil servants that support expanded social protection and access for all. Greater attention should be paid toward the allocation of apolitical hiring based on competences and to the effective organization of the civil service to improve social protection,” affirmed Osman.